Two years ago, I found myself thinking that dining at an Indian restaurant was adventurous. Boy has a lot changed since then. I have adventurous lunch dates with my friend Lauren. Some have been amazing, some were not worth mentioning. She has introduced me to multiple unique eats while I introduced her to Bone Marrow. One day for lunch, we decided to venture into Ho Ho Choy - Shabu Shabu, two restaurants who share one roof, located on Fowler Rd Tampa. During Gabe's first year living in Tampa (sans me), I had seen this establishment multiple times. 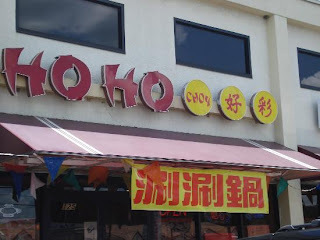 Ho Ho Choy / Shabu Shabu is located in a strip mall which would be sketchy to the arriving eye. They serve everything from sushi to dim sum to a hot pot. While one of my favorite tea spots is located in that establishment, I never thought in a million years that I would eat there. When Lauren mentioned the following words "the best steam buns one could ever eat", how could I turn it down. We decided to dine at Shabu Shabu, who offers a hot pot - which I have described to many as The Melting Pot meets Pho. I was all about making my own soup and out came dishes of fresh veggies a raw egg and frozen protein. We were asked how spicy we wanted our broth (medium for me with a side of heat for Lauren). There was a push cart full of every seasoning you could ever wish for. We stocked up on hoisin, siracha and some peanut sauce (just because it was there). I can honestly say that I cannot wait to go back. Everything we had was DELICIOUS. And when two fortune cookies give you this message? I can say from experience, with one follows the other. I loved this dining experience!! Delicious lunch and great pics! Cheers to foodie adventures! I want to go back soon!! This is a great spot! I haven't tried the sushi, but between the dim sum and the Shabu Shabu what the need. I want to try the sushi next time but I am not sure how I can go without getting the hot pot and dim sum! oh I love a good hot pot! I also love korean bbq. If I'm out that way I will have to check this place out. This place was so good - you would love it. Are there any other hot pot locations in the area you would suggest? I'm totally down to get dim sum here soon!!! I love the built-in hot pots at each table too..so cool! Did you try any dumplings there by any chance? This sounds like a really cool place! Everything sounds pretty darn yummy to me...and I've never had a hot pot before, but I'm pretty sure I'd love it.